Unlike adultery by those who are officially “monogamous,” polygamy in itself is not immoral. It has been practiced in many cultures throughout history. It is simply another alternative form of family structure suited to certain circumstances and social needs in different times and cultures. Examples of such needs include caring for widows and orphans of victims of wars, or dealing with demographic problems such as occasional imbalances in the gender ratio. Polygamy has been practiced as well by various religious communities, including some Jews, Christians, and Muslims. In fact, the Quran is the only monotheistic holy book that explicitly limited, restricted, and regulated the practice of polygamy (Quran 4:3, 129). Yet, due to the wide circulation of erroneous information about Islam, many have the impression that Islam introduced this form of marriage. Among all great polygamous prophets, Prophet Muhammad is often singled out for criticism for practicing polygamy in the last few years of his life. In fact, none of his marriages raise any question about his chastity and moral excellence. Some ask, however, why Prophet Muhammad limited his followers to a maximum of four wives, while he himself exceeded that maximum.4 The question itself reflects a serious misunderstanding. These limits, as well as the exception made for the prophet, were all divine instructions in the Quran, which to Muslims is the word of God, not the word of Muhammad or his own instructions or stipulations. After all, the practice of unlimited polygamy was common and socially accepted in pre-Islamic Arabia. If it were true that the Prophet wished to have more than the four wives that “he restricted” his followers to, then why did he “restrict” them in the first place? Why not “live and let live”? A related question is this: Why did the Prophet limit himself to one wife, Khadijah, for the prime time of his youth and manhood, from the age of 25 until he was 50 years old when she died? This lengthy monogamous marriage spanning most of his marital life took place when polygamy was socially accepted and widely practiced and before any Quranic revelation restricting such a practice and limiting, in the general case, the number of wives to a maximum of four. To claim that the Prophet was untruthfully “making up” or forging verses in the Quran to “give himself” an exception, is inconsistent with his integrity and acknowledged truthfulness. It is also utterly contrary to reason. A legitimate question however is this: Why did God make such an exception for the Prophet? Like some other prophets before him, Prophet Muhammad was not only a prophet, but also the head of a community which eventually became a political entity. As the central personality of both faith and community, he was in a unique position to reconcile various warring peoples to one another, reconcile the hearts of his enemies, and fulfill his mission through the most peaceful means possible. An effective means of achieving this mission in a tribal society is bonding through marrying women from the various tribes or clans. This is one of the likely explanations of the Prophet’s marriage to Umm Habibah, daughter of his archenemy, Abu-Sufian. Umm Habibah migrated to Abbysinia with her husband due to persecution of Muslims in Makkah. Her husband became an apostate there and invited her to apostasy like him, but she refused and remained steadfast in her faith. He later died there. The Prophet offered to marry her and she accepted. Besides the humanitarian gesture toward a widow left without a provider, who had been rejected by her family due to her faith, this marriage might have softened the heart of her father, to a degree. In fact, he later embraced Islam and this helped avoid unnecessary bloodshed. A similar case is his marriage to Maymounah Al-Hilaaliyyah, a woman from the Najd region who was twice married before and whose people were party to the treacherous cold-blooded murder of seventy of the Quranic memorizers who were there on a peaceful educational mission. Instead of revenge and more bloodshed, the Prophet married one of their women who needed care. As a result of this act of kindness, her people were at least neutralized, and some embraced Islam. If it were true that the Prophet wished to have more than the four wives that “he restricted” his followers to, then why did he“restrict” them in the first place? Why not “live and let live”? A related question is this: Why did the Prophet limit himself to one wife, Khadijah, for the prime time of his youth and manhood, from the age of 25 until he was 50 years old when she died? To reconcile the hearts of those who fought against him and to provide an example of good treatment of war captives, the Prophet himself freed three women captives and offered to marry them. This act of magnanimity helped to blunt the hatred and enmity of their clans. The offer to be wives of the Prophet himself and become revered “Mothers of the Believers” was no small feat, and an honor for them and their clans. It was also a remarkable goodwill gesture by the Prophet toward those who unfairly showed enmity to him and spared no effort in undermining his mission. Juwairiyah, Safiyyah, and Rihaanah fall in this category. In the case of Juwairiyah, the example of the Prophet freeing her resulted in an immediate action by the victorious Muslims who freed all their captives from her tribe. They felt it inappropriate to hold the in-laws of the Prophet as war captives. Juwayriyah’s father, Al-Harith, ceased hostilities against the Muslims and later embraced Islam. This appears to be one of the measures used to free those in captivity, so as to gradually and smoothly end existing forms of slavery by drying up even the last source of captivity — war captives. Other marriages of the Prophet were apparently intended to cement the relationship between the Prophet and his closest friends and helpers. This category includes his marriage to Aishah and Hafsah, daughters of his closest companions, Abu-Bakr and Umar. In Hafsah’s case there was another humanitarian touch seen in other marriages of the Prophet as well — teaching the community to take care of widows. This is especially true of the widows and orphan children of those who sacrificed their lives in defense of their faith and their community. Hafsah’s former husband, Khonays, was a courageous defender in the Battle of Badr and continued to fight in spite of his injuries. He later died because of his wounds. This motive is obviously behind the Prophet’s marriage to other martyrs’ widows such as Zainab Bint Khozaymah (who died shortly after her marriage to him) and Um Salamah, who had four children to look after following the martyrdom of her husband. The same caring attitude applies to his marriage to Sawdah, an elderly widow he married after the death of his first wife Khadijah. This marriage opened the hearts of many of her clan to Islam. One of the Prophet’s marriages, to Zainab, daughter of Jahsh, was obviously for a legislative reason. Zainab was a cousin of the Prophet. He persuaded her to marry his freed slave and former “adopted son” Zaid. The apparent reason for his encouragement, in spite of her reluctance, was to break the attitude of aristocracy where a person from a noble stock would not consider marrying a commoner. The Prophet sought to affirm the egalitarian nature of Islam whereby a person should be evaluated only on the basis of his/her qualities of character and moral conduct, not on the basis of his/her socio-economic status. Marital problems between Zaid and Zainab led eventually to divorce. The Arabs considered an adopted son the same as a biological son. They gave him his adopting father’s name, a custom that the Quran invalidated, demanding truthful lineal identity (Quran 33:4-5; 40). No one other than the Prophet could have contravened the established custom of adoption and implement a new divine law. Another criticism of the Prophet relates to his marriage to Aisha, daughter of his companion, Abu-Bakr. Some point out that in the collection of Hadeeth by Bukhari, Aisha reported that her marital contract took place when she was six years old, and that she did not live with the Prophet until three years later, after migration to Madinah. Some refer to this marriage as “child molestation” or “pedophilia.” One wonders how such a respectable well-to-do father as Abu-Bakr would give his beloved daughter Aisha to be “molested,” and with the blessings of Aisha’s own mother. And how come none of the watchful critics and archenemies of the Prophet ever raised any question about this marriage, even though, like some of today’s critics, they were eager to find any fault with which to discredit the Prophet? This signifies that the Arab culture at that time, just as in other cultures and historical periods, considered adolescence as an acceptable age for marriage (in addition to the fact that puberty might take place earlier in some cultures). The fact that that there was a three-year gap between the marital agreement and the dwelling of Aisha with the Prophet seems to support the existence of this custom. In fact, Aisha was engaged to another individual before her parents decided to marry her to the Prophet instead. This shows how common it was to marry at a young age. Needless to say, the successive increase of the minimum marriageable age, after reaching adolescence, is an arbitrary matter based on cultural and social norms, subject to change with time, culture, and other circumstances. It should be noted that the special exception to the Prophet concerning the maximum number of wives (Quran 33: 50) includes also special restrictions on him and his wives related to privileges available to all others. For example, his wives, as “Mothers of the Believers,” were not allowed to remarry after him (Quran 33: 53). If the Prophet were required to divorce wives beyond the maximum of four, it would have done them an injustice — to be divorced and disallowed to remarry. Furthermore, for each of the Prophet’s marriages there was a specific lesson, social or legislative. By divorcing some of his wives, those lessons would be effectively negated, especially the unifying function of marrying women from different clans and backgrounds. This diversity allowed close observation of his private life and teachings, allowing the wives to communicate them to their respective folks. Also, unlike any ordinary Muslim, the Prophet was not allowed to divorce any of his wives and marry others (33:52). In conclusion, it should be noted that when it comes to the Prophet’s chastity, self-control, and moral excellence, there is no match. His role is a universal, virtuous, and practical one. He kept his chastity as an unmarried youth, maintained real and faithful monogamy for 25 years, during the prime years of his youth and manhood. Even when he practiced polygamy, he did so for humanitarian and diplomatic reasons during the last few and waning years of his life. His extraordinary schedule and responsibilities, his regular lengthy night prayers, his amazing spiritual leadership and pragmatic achievements in a short span of years — all that precludes any notion of obsession with worldly pleasures. Caring for women, especially older ones, and for their orphan children, within the context of a marital relationship, is scarcely to be considered a sensual motive for polygamy, especially in a social setting where many widows and orphans were left without support and protection. Those who try to blemish the noble character of the Prophet only blemish their own objectivity and sense of fairness. May Allah cure their hearts of hatred, borne of ignorance and pre-conceived stereotypes; and may He help all learn from the inspiring lives of the great prophets instead of unfairly and ignorantly reviling any of them. Thankfully, the majority of people do not share the “logic” of those who take a prejudicial, offensive, and hateful stance. Those from other faith communities who speak up against denigration of the Prophet, and demonstrate their support of mutual respect and peaceful co-existence, should be commended. Peace be upon all those who follow the guidance of God, manifest His love in deeds as well as words, and sincerely promote human brotherhood and mutual understanding. A more correct term is polygyny since the term polygamy includes multiple wives (polygyny) or multiple husbands (polyandry). The latter form is not permissible in Islam. However, since the term “polygyny” is unfamiliar to many, the term “polygamy” is used to refer to “polygyny” only. See for example, 2 Samuel 5:13 and 1 Kings 11:3 in the Bible. See for example, Edward A. Westermarck, The History of Human Marriage, (5th Edition), Macmillan and Co., London, 1935, Vol. 3, pp. 42-43; also T.K. Cheney and S. Black (Editors), Encyclopedia Biblica, Macmillan, London, 1935, Vol.3, p. 2946. The total number of consorts of the prophet throughout his life was thirteen. Two of them died in his lifetime (Khadijah and Zainab, daughter of Khozaimah). For 25 years his only wife was Khadijah. For another 3 years the only wife living with him was Sawdah since Aisha was still in her father’s home. For another two years, the wives living with the Prophet were Aishah and Sawdah. The polygamous period was mainly during the last seven years of his life. 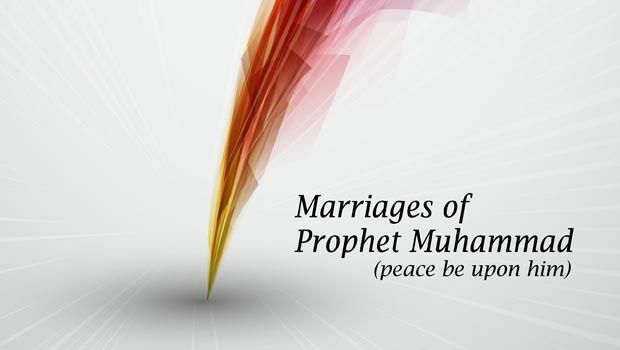 For a more detailed treatment of this and other marriages of the Prophet, check: www.islamicity.com/multimedia/Radio/RA200. Scroll under “Series L: Muhammad the Last Messenger of Allah” to programs 41-50. For a general treatment of gender issues, check the author’s Gender Equity in Islam at: www.Jannah.net. Dr. Jamal Badawi Dr. Jamal Badawi is “Professor Emeritus” at St. Mary’s University in Halifax, Nova Scotia, Canada. He is a respected scholar and member of Fiqh Council of North America.